Not to be confused with Richmond Hill, Ontario. 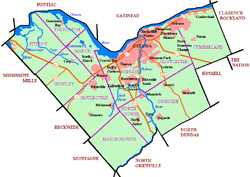 Richmond is a village and former municipality within the city limits of Ottawa, Ontario, Canada. Founded in 1818, it spans the Jock River, a tributary of the Rideau River. Like many communities in eastern Ontario, Richmond houses several unique populations. Some residents have historic and economic roots in the immediate area. Richmond operates as a small core to its residents. To others, the village serves as a bedroom community for the larger urban area of Ottawa. Richmond is 15 km from North Gower, 32 km from Carleton Place, 36 km from Downtown Ottawa, 41 km from Smiths Falls and 45 km from Perth. Its population at the Canada 2006 Census was 3,301. The village was originally laid out for the Government in 1817 by Major George Thew Burke, and settlement commenced as early as 1818. This was a military point for a number of years. The Duke of Richmond, then Governor General of Canada, died here in 1819 from the bite of a rabid fox, in a frame barn on Chapman's farm, about 4 miles from the village, on the Goodwood river. Later renamed the Jock River. The Masonic Arms Tavern, his abode on the previous night, was renamed Duke of Richmond Tavern in his honour. The village derives its name from the Duke of Richmond. Monument on Perth Street (main street) in Richmond Ontario Canada describing the history of Richmond. The title is "Richmond Military Settlement 1818". From 1818 to 1822, the village was managed by the Settling Branch of Upper Canada's Military Department. Village life was dominated by military culture and institutions during these early years. While official plans of the village demonstrate an optimism for its future growth and importance, this never came to pass. By the time the military relinquished control of the village in 1822, very few civilians had settled. Many historians argue that the highly planned villages of early nineteenth century Ottawa Valley were a failure compared to villages and towns that sprang up in a more "organic" nature in response to such factors as proximity to transportation routes, natural resources, and quality farm land. In the case of Richmond, the rising importance of Bytown and the building of the Rideau Canal several kilometres east of Richmond significantly contributed to its failure to thrive. By 1832, Hamnett Pinhey described the state of Richmond to the Freeholders of Carleton as, "a jail in itself." He goes on to note that, "I have known that place these thirteen years, it was then a rising place, but it has been falling ever since, and is now almost nothing; not a house has been built but many a one has fallen down and still are falling... if you get into it in the Spring, you can't get out till Summer; and if you get into it in the Fall, you must wait till the Winter, and whose fault is it but the Magistrates and Gentry of Richmond; that is to say the Shopkeepers?" Richmond was incorporated as a village on the Goodwood river, in the east corner of the township of Goulbourn, 21 miles from Ottawa City, and 11 miles from the Ottawa river in 1850. For a number of years the trade and business was very active, but by the 1860s appears to have declined. By 1866, the village with a population of 600, contained several general stores, flouring mills and tannery; a grammar school, building of frame, W. Houghton, master. There were four churches-Church of England, built of stone, Rev. J. C. B. Pettit, rector; Church of Scotland, building of frame, Rev. Wm. P. White, minister; Wesleyan Methodist, building of frame; and the Roman Catholic church, built of stone, Rev. Peter O'Connell, parish priest. Richmond's amalgamation into the city of Ottawa is a cause for concern for many local residents. These concerns are represented by groups such as the Carleton County Landowners Association. Amalgamation has also gained the attention of several researchers concerned with sustainable community development and local governance. David Douglas' study of restructured rural communities points out that threats to local traditions and values, lack of local control over the restructuring process, and a marked decrease in democratic representation are some of the important issues that have been neglected through this process and which pose a significant threat to the health and liveability of amalgamated rural communities such as Richmond. Contained within the City of Ottawa structure, Richmond is vulnerable to many of Douglas' concerns. The village mascot is a fox, after a local legend relating to a rabid fox who is reported to have been responsible for spreading the disease to the Duke of Richmond. The disease developed rapidly and on 28 August 1819 he died in extreme agony. The village of Richmond has many historical buildings such as St Philip's Church, which is the oldest church in the Catholic Archdiocese of Ottawa. On August 11, 2014, Richmond residents woke to the news that the Richmond Bakery, a local landmark for citizens, closed its doors suddenly after 75 years in business. The bakery was well-known in the Ottawa area for its old-fashioned doughnuts, fresh bread and Chelsea buns and many took to Twitter to recount their memories of childhood trips to the bakery. The owner stated that challenges he faced trying to find experienced bakers was the reason for closing. ^ Richard Reid ed., Upper Ottawa Valley to 1855. Ottawa: Carleton University Press, 1990. ^ David J.A. Douglas, "The Restructuring of Local Government in Rural Regions: A rural development perspective," Journal of Rural Studies 21 (2005) 231-246. ^ "#RichmondBakery". Twitter. Retrieved 16 November 2014. ^ Wright Allan, Samantha (August 11, 2014). "Richmond Bakery owner still reeling from closure" (Last Updated: August 11, 2014 6:07 PM EST). The Ottawa Citizen. Retrieved 16 November 2014. ^ "HISTORY OF THE RICHMOND BAKERY" (PDF). GOULBOURN TOWNSHIP HISTORICAL SOCIETY Newsletter. 1: 8, 9. 2014. Retrieved 16 November 2014. ^ Karamali, Kamal (August 11, 2014). "Richmond Bakery Closes". CBC News Ottawa. Retrieved 17 November 2014. ^ "Retail Bakeries (NAICS 311811): Financial Performance Data". Industry Canada. Government of Canada. Retrieved 17 November 2014. ^ Wright Allan, Samantha (August 11, 2013). "Longstanding Richmond Bakery Closes Quietly on Saturday". The Ottawa Citizen. Retrieved 17 November 2014. The McElroy Family of Richmond - The history of Richmond written by William McElroy, during the summer of 1923.